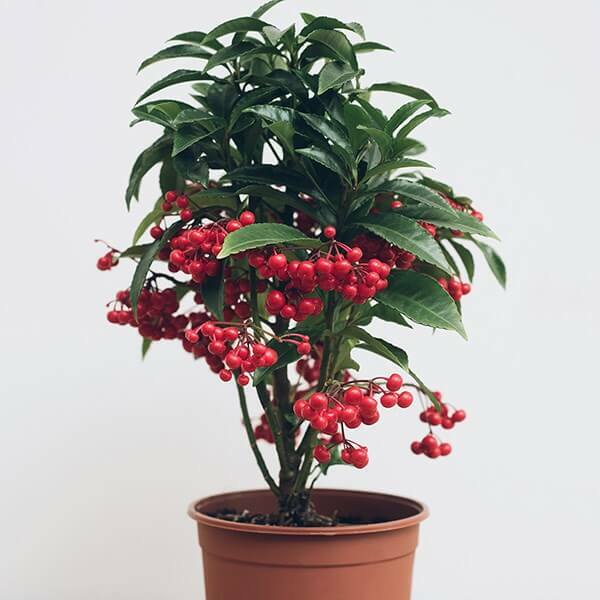 Christmas Berry (Ardisia crenata) is an ornamental, evergreen shrub or small tree that reaches 1 meter, often with a single stem. Leaves are dark green, thick, glossy, and have tightly waved edges. It produces small, clusters of white or reddish, fragrant blossoms which bloom from late spring to early summer. Blossoms are followed by shiny, coral to scarlet red fruits which often remain on the plant year round. The flowers and berries appear within the midsection of the tree. The crushed Ardisia crenata plants, or their extracted juice, are used in the treatment of skin diseases and earache. The root is anodyne, depurative, febrifuge. It is used to stimulate blood circulation. The juice from the root is used as a treatment against fever, cough, and diarrhea. The leaves of Ardisia crenata are being investigated as a remedy to stop asthmatic contractions and spasms. Synonyms: Ardisia bicolor, Ardisia crenata var. bicolor, Ardisia densa, Ardisia elegans, Ardisia glandulosa, Ardisia konishii, Ardisia kusukusensis, Ardisia labordei, Ardisia lentiginosa, Ardisia miaoliensis, Bladhia crenata, Bladhia kusukusensis, Bladhia lentiginosa, Bladhia punctata, Tinus densa. 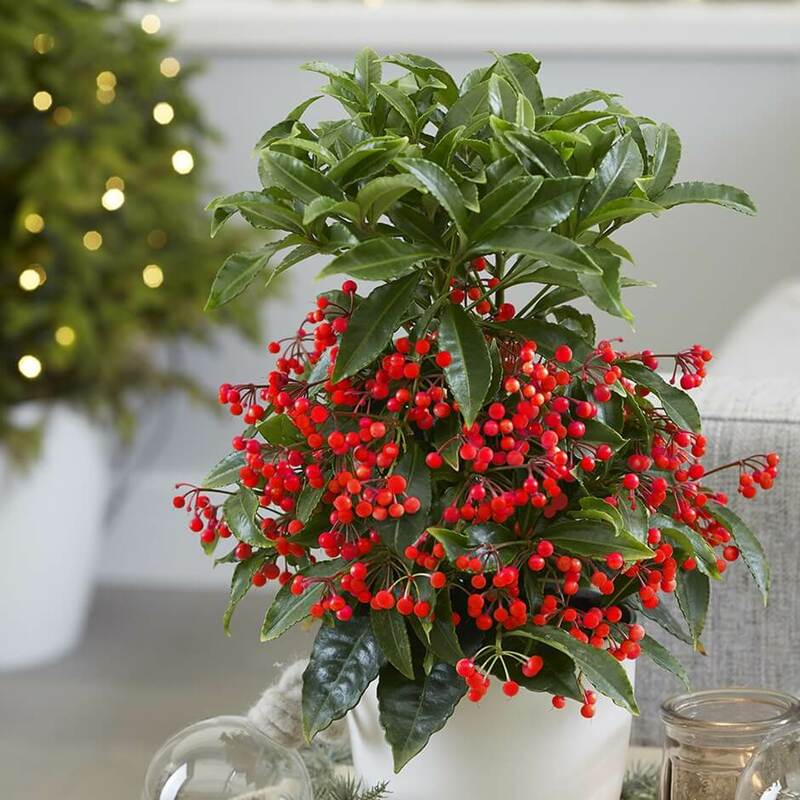 Common Names: Christmas berry, Australian holly, coral ardisia, coral bush, coralberry, coralberry tree, hen’s-eyes, and spiceberry. It grows best in the bright indirect light. Direct sun burns the leaves and causes the berries to shrivel. It prefers a moist but well-drained potting mix, use a combination of two-thirds of soil-based potting mixture and one-third of an equal-parts mixture of peat moss and coarse sand or perlite. Water moderately, during the growing season (spring and summer) and always keep the soil evenly moist but not soggy. Soil should be watered whenever it begins to feel dry. In autumn and winter, allow the top 1 inch of soil to dry out between each watering. It requires Cool to average room temperatures 45°F – 65°F / 7°C – 18°C. Average house humidity is advised. Misting leaves will improve humidity during the summer months. Fertilize every 2 weeks from early spring through summer with a balanced liquid fertilizer diluted by half. In fall and winter, feed monthly. Christmas berry can be propagated by seeds (early spring) or stem cuttings (during spring a summer). Take 10 – 15 cm stem tip cuttings in spring and place upright in moist peat moss-based potting mix. Cover the plant and pot in a plastic bag to hold in humidity. It is susceptible to red spider mite, mealy bug, and aphids.